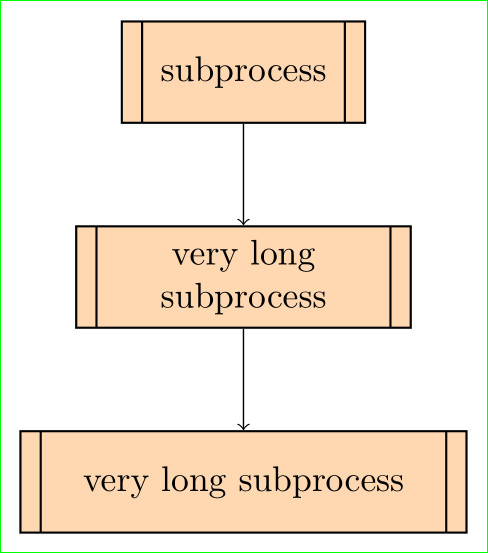 I found this guide on making a flowchart with tizk, but there is no option for the subprocess box. How could I create a box like this, with the writing in between the two lines on the inside? but this produces 2 lines on every side, whilst I want the double line on only the two vertical sides. It also puts the coloured background only on the inside one whilst I want it to be on the outermost rectangle. and put it in preamble of a document. Not the answer you're looking for? Browse other questions tagged tikz-styles flow-charts or ask your own question. Redefining some of predefined styles in tikzstyle?